Small businesses may not have large IT budgets like enterprises do, but that doesn’t mean they can’t have powerful, productive devices. Acer’s new Chromebook 14 is ideal for small businesses and other commercial customers, combining Chrome OS for secure productivity with the latest Intel processors, rugged features and long battery life. Chromebooks designed for work offer a familiar interface to employees, fast boot-up times and the peace of mind that comes with safe, secure laptops. And Chromebooks keep costs low, which is essential for small and medium-sized companies, so they can invest in other parts of their core business. A recent IDC study estimates the centralized management of Chrome OS devices contributes to a 61 percent lower total cost of ownership (TCO) and 93 percent faster deployment in classrooms, something that business owners can also appreciate. 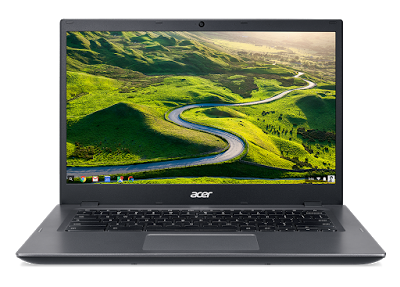 The Acer Chromebook 14 is among the first to use Intel’s 6th-generation Celeron and Core processors and can be configured with up to 8GB of memory to handle numerous browser tabs and applications simultaneously. Connecting to the cloud is quick thanks to dual-band 802.11ac Wi-Fi, which is 2 to 3 times faster than older wireless technology. In addition to a pair of standard USB 3.0 ports, SD card slot and HDMI output, the Chromebook 14 also features a USB 3.0 Type-C connection, which creates a full desktop solution thanks to the optional docking port with a single cable for additional displays, speakers and up to five more USB devices. Employees will appreciate the battery life of up to 12 hours* on the 14-inch display, available in either 1366 x 768 or 1920 x 1080 resolution with wide viewing angles. Weighing 3.2 pounds, the Acer Chromebook 14 is a device that can easily be carried to meetings or while traveling. The laptop with spill-resistant keyboard also meets the rugged MIL-STD 810G military standard to protect against drops, dust, temperature and humidity. The Chromebook 14 cover is made from damage resistant Vibrant Corning Gorilla Glass that can display a customized image such as a detailed photo or a company logo. Like other Chrome for Work devices, the new Acer Chromebook 14 affords the speed, simplicity and security of Chrome OS, which is automatically updated every six weeks. Neither business owners nor their employees have to take time out of the workday for lengthy software updates. IDC estimates that simple Chrome OS updates and fast deployments can save $602 per Chromebook in support costs over three years. Chromebooks support growing business because they’re easy to share among workers — each user on the device gets their own encrypted space — so new employees can be up and running within minutes. Switching from one Chromebook to another doesn’t interrupt workflows because apps and data are synchronized between devices. And your new workforce can immediately start collaborating with others in real-time with Google Apps for Work through the familiar Chrome browser. Legacy applications and Windows desktops are also easily accessible on Chromebooks through Amazon WorkSpaces and the Dell Wyse vWorkspace Connector designed for Chrome. While employees are getting work done on a Chromebook, business owners can rest assured that their data is secure. Chrome OS verifies upon bootup that it hasn’t been compromised and all apps run in protected sandboxes to reduce malware risks. The new Acer Chromebook 14 will be available in the coming weeks at Acer authorized resellers, starting at $349.99 USD in the US and €249 in EMEA regions. If you have questions or would like to learn more, please contact us on our website. To learn more about how Chrome and Android devices can work for your small business, check out our recent webinar. *Battery life may vary depending on usage, configuration and other conditions.